Optimization thanks to etiCALLS – welcome to the conferences! etiCALLSNewsnewsOptimization thanks to etiCALLS – welcome to the conferences! First of all, etiCALLS is permanent markings and easy application. Additionally, etiCALLS means guarantee of reliability of tests and precise identification of samples and laboratory tools- such opinions about this system we hear from you very often. We’re glad that etiCALLS has gained your trust and is appreciated by laboratory assistants in their daily work. It motivates us to further actions and subsequent meetings, during which we present how to optimize the work of pharmaceutical and medical laboratories thanks to etiCALLS. In May, you will have new opportunities to discuss with us how to further improve the process of identifying laboratory samples and tools. In addition to solutions for cryogenics, low temperatures and non-migrating glue, we focus on the novelty: a solution with labels resistant to solvents and chemicals. The etiCALLS system will soon be presented at the Spring Pharmaceutical Conference „Effectiveness and Optimization”. It will take place from 17 to 18 May in Gniew. This is meeting of specialists and practitioners from the industry interested in process optimization and risk reduction. 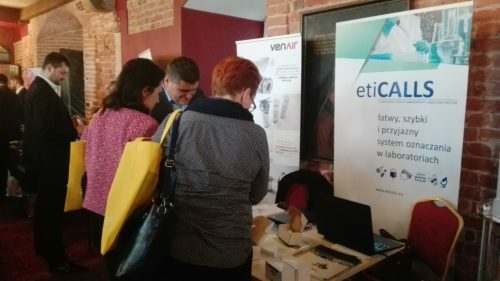 The EtiCALLS system, which facilitates the work of laboratory assistants, will be also promoted on 24 and 25 May at the National Scientific and Training Conference of the departments of the Polish Society of Laboratory Diagnostics in Szklarska Poręba. Previous PostPrevious post EtiCALLS awarded! the group of our readers! To complete the process of adding to the newsletter please click on the confirmation link that we sent to Your email. I agree to the processing of my personal data for marketing purposes by Etisoft Sp. z o.o. Full content. I agree to the processing of my personal data by Etisoft Sp. z o.o. in order to send commercial information by electronic channels to the e-mail address provided by me. Full content.